I was still really tired after Monday's long distance (70 miles may not be a lot for some riders but it's a long day for me) and spent Tuesday crossing the Brenne national park over the course of twenty fairly flat miles. The Brenne region looked quite interesting on the map, with a dense clustering of lakes and marshes, but in reality it was hard to see much of it due to the flat terrain and roadside trees and hedges, and I only got one or two glimpses of lake. I had lunch in a restaurant at St. Gaultier, a 10euro menu which was not great and slightly lacking in vegetables, but a vast improvement over my own cooking, and you can't really go wrong when there is wine included in the price. The waiter talked to me in broken English about where I was going, and, like most people, was a little surprised that I was going all the way to Marseilles. I was approaching the half-way point across France, and wondered how far I would have to get before people stopped being surprised! 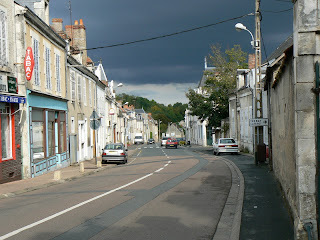 I stayed in St. Gaultier and set up camp on the Oasis de Berry site for 14euro/night (ouch!). In the afternoon I rode across town to the Champion supermarket to stock up and make sure I would have a good dinner. The sky turned black as I entered the town and I could only imagine how much rain was about to fall on me... fortunately nothing really came of it, everything stayed quite dry and the sky cleared after a while. Dinner was an improvement - I prepared myself a fine meal of pasta with pepper & aubergine sauce, shallots, black olives, pancetta and garlic, accompanied by a salade verte. Tuesday October 9th - whee!